The ultimate collectors' edition is limited to just 15 very exclusive copies. Each comes in a hand made leather covered wooden trunk that has Ron's signature embossed in gold on the lid. 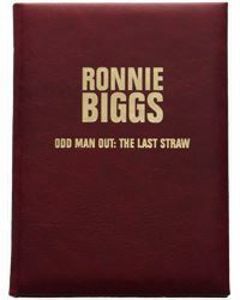 Inside the trunk is a numbered, leather bound edition of Odd Man Out: The Last Straw; a specially numbered leather bookmark; a certificate of authenticity signed by Ronnie Biggs, Chris Pickard (who helped Ron write the book), and publisher Cliff Moulder of MPress; plus a standard hardback copy of Odd Man Out: The Last Straw. 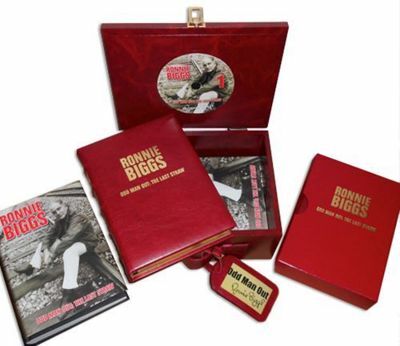 Each of the 15 ultimate collectors' editions also come with a matching leather travel tag and a numbered DVD that includes footage of Ron signing the certificates; being shown the leather bound sets for the first time by his son Michael; video footage from the press conference at Shoreditch House to mark the release of the book; plus a library of rare photos and other special extras.